Kendriya Vidyalaya Kanjikode celebrated Reading Day on June 19, 2018. 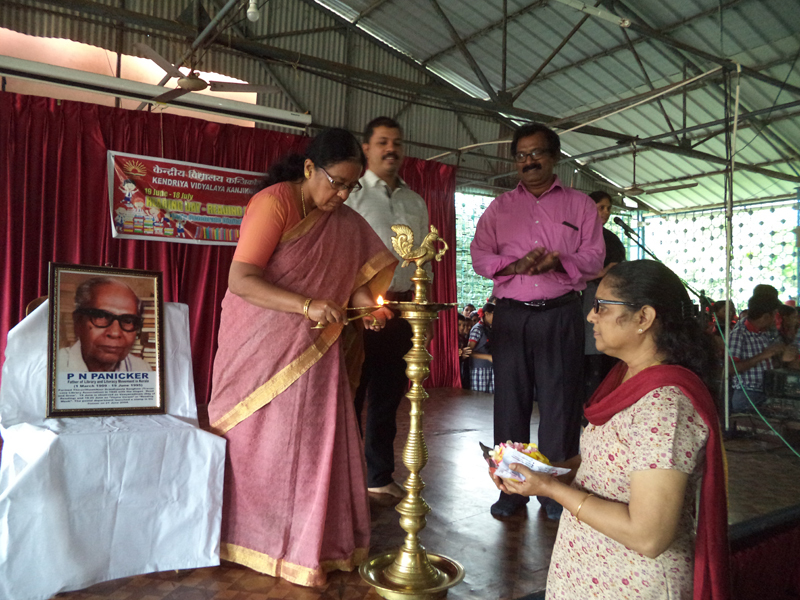 Mrs. K Rajeswari, Principal inaugurated the month long celebrations on 19 June 2018 in the morning assembly by lighting the lamp. The staff and students paid homage to Shri. P N Panicker, Father of Library Movement in Kerala. Mr. Mujib Rahiman, Librarian administered the reading pledge. Various competitions and activities are being organised during the Reading Month. Mrs. Rugmini Menon, TGT English announced the competitions that will organised by the Vidyalaya for the students, parents and teachers. The students presented a short programme on the life and contributions of Shri. P N Panicker which was followed by the Reading Song. Mrs. K Rajeswari, Principal stressed the importance of reading judiciously selected books and to contribute to the nation building. Mr. Subramanian, Vice Principal addressed the assembly and stressed on complete utilisation of library resources.